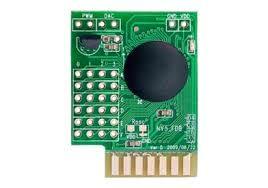 Single chip voice Recording and Playback device for single 20 to 30 second message with external resistor selection. No external ics required and minimum external components. Non-volatile flash memory technology, No battery backup required. 100K record cycles (typical) and 100 year messge retention (typical). User-friendly, Easy to use operation. Level activated recording and edge activated playback switches. Automatic power-down feature for longer battery life. Chip enable pin for simple message expansion. Designed Developed by Web Element Solutions Limited.